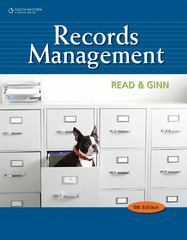 Records Management 10 Edition RECORDS MANAGEMENT, Tenth Edition, provides a comprehensive introduction to the complex field of records management. The text features sound principles of records and information management that include the entire range of records--physical (paper), image records, and electronic media used in computerized systems. Part I, Records and Information Management, provides thorough coverage of alphabetic filing rules, as well as methods of storing and retrieving alphabetic, subject, numeric, and geographic records. The rules agree with the latest standard filing guidelines presented by ARMA International. Part II, Electronic Records Management, introduces electronic records file management as well as classifying electronic files using metadata, taxonomies, and file plans; and the use of magnetic, optical and solid state media through the phases of the records management life cycle.A new chapter introduces Enterprise Content Management (ECM) and describes how Microsoft SharePoint is used in Records Management. Part III, RIM Program Administration, delves into the records and information management (RIM) program components and guidelines; with expanded coverage of information governance, social media, and the records and information manager's responsibilities. In addition to content based on ARMA International standards and best practices, the text features realistic database activities, profiles of real-world professionals, and practical advice and examples to prepare students for career success. The Tenth Edition features extensive updates, including a restructuring of the chapters to reflect the growing importance of electronic records management.